There are many reasons to clean your own whole artichokes and trim them down to the hearts. Doing it yourself is the only way to end up with fresh, rather than canned, marinated or frozen artichoke hearts. The process can be time-consuming but it isn't difficult. The first artichoke you do may end up looking a bit mangled, but you learn a lot the first time. The more you practice, the more you will improve, and your artichoke hearts will eventually look smooth and neat. For the tastiest, most tender artichoke hearts, start with fresh, moist artichokes. Like all vegetables, artichokes slowly dry out after they've been harvested. As they age, they lose moisture. The leaves pull away from the center, the stem wrinkles, and the tender inner heart gets increasingly fibrous, dry, and tough. Look for artichokes with tight, compact heads and fresh-cut stems. Note that all cut stems will be brown—artichokes oxidize and turn brown very quickly after being cut. Look for artichoke stems that aren't dried out. For basic steamed or stuffed artichoke hearts, cut close to the base so the artichoke can stand up on its own. For Roman-style artichoke hearts or grilled artichoke hearts, remove only the browned bit at the end and peel the rest of the stem later. Pull off and discard the artichoke leaves, starting with the outer ring and working your way around and in the entire thistle. Most of the leaves will snap off, leaving the meaty bit at their ends still attached to the heart. Don't worry if you end up pulling the whole leaf off. Keep going. Pull off and discard the artichoke's leaves—as you get to the inner leaves, they are more tender, flexible, and yellow. If you want to, you can keep the leaves and cook them. One option is to toss the plucked leaves with a bit of olive oil, lay them on a roasting pan, and cook them in a hot oven until they are tender (for about 20 minutes). Serve the leaves warm or at room temperature and eat them as you would eat a steamed artichoke; simply scrape the tender flesh at the ends of the leaves with your teeth. For an added treat, dip the leaf in melted butter or aioli before eating. If you really enjoy the leaves, try preparing a simple steamed whole artichoke. Grab the tops of the center leaves and pull up to remove them. This will reveal the fuzzy, choke underneath. These leaves are often a bit stiff at the ends and depending on the specific variety, may have lovely purple tips. Use a spoon to dig in and scrape off the fuzzy (and inedible) choke. It's called a choke for a reason. One bit of the hairy choke in your mouth is quite unpleasant. Not only does it taste bad, but it has a stiff and unpalatable disagreeable texture. 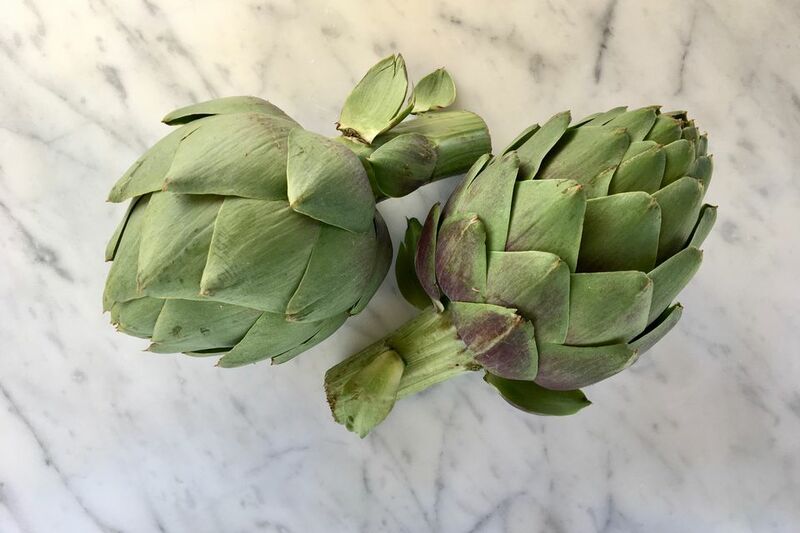 Use a paring knife to cut off and discard any tough, fibrous, dark green parts clinging to the outside of the artichoke heart. Be aggressive. You only want the tender, light flesh of the heart when you're finished. Now you have a fully trimmed and cleaned artichoke heart. It is ready to cook and eat. If you're not going to cook it right away, put the cleaned artichoke heart in a bowl of cool water with a few tablespoons of lemon juice or white wine vinegar. This will keep the hearts from oxidizing and turning brown.